A local wave of indignation against bicyclists spread across Washington, DC after the local NBC station reported that over 1,500 bicycles in DC had tripped red traffic light cameras with impunity over the past year. This follows a flurry of comments two years ago when Washington Post columnist Courtland Milloy called bicyclists bullies and later wrote bicyclists should be banned from the city center. Just before that Washington Post writer John Kelly asked bicyclists to please stop riding on my sidewalk, a plea that was repeated in 2016 by Frederick Kunkle. To be fair Washington Post reporter Ashley Halsey pleaded for toned down the coverage of poor bicycle behavior. 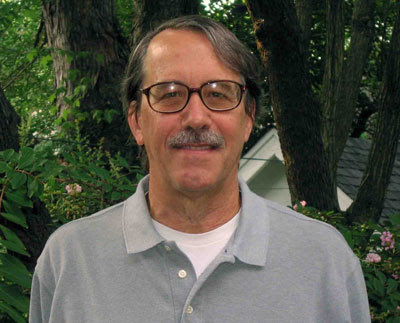 A recent article by Kunkle with the provocative headlines that bicycles blow through red light cameras actually is a balanced report of the views of AAA and the Washington Area Bicycle Association. A motorist seeing a car breaking the law generally gives a shrug of the shoulders, attributing the violation to a misbehaving driver. By contrast, the same driver seeing a bicyclist breaking a traffic law becomes outraged against a whole class of cyclists. Truth be told, some motorists are irritated even when bicyclists conform to the rules of the road. The hue and cry about bicycle behavior is a symptom of what I call the bicycle-traffic conundrum. The bicycle is neither fish nor fowl. Bikes are not wanted by various Washington Post writers on the roads or on the sidewalks. In addition, traffic laws also are written mainly for cars and pedestrians, but the 20-30 pound bicycle is nothing like a plodding pedestrian or a 3,000 pound car. The rules of the road should reflect that bicycles are slower than cars and faster than pedestrians. Compared to cars they also are more maneuverable, provide better vision of traffic and can stop more quickly. The main cause of the driver frustration with bicyclists is the lack of the predictability. This actually is caused in part by a lack of serious investment in bicycle infrastructure and the regulations surrounding them. In the Washington DC Metropolitan Area bicycle lanes begin and end within 100 yards forcing cyclist to swerve back and forth into traffic. Due to inadequate barriers and enforcement in the downtown cars and delivery trucks often park on DC bike lanes without being ticketed. Drop off areas for those exiting motor vehicles squeeze bike lanes and push bicycles into the path of cars. How would motorists react if they are forced to dangerously change lanes every 100 yards or so, or to travel on a road that disappears into a pedestrian walkway? Far from opposing infrastructure for bicycles, AAA (of which I am a member) and the motorists they represent should be welcoming improvements that better define the role of the bicycle in a multimode traffic system. Well designed bicycle lanes will remove most bicyclists from car traffic and from pedestrian walkways. Only recently has the Washington DC City Council begun to worry about car and bicycle accidents by passing the Bicycle and Pedestrian Safety Act. In addition DC's Mayor Bowser has endorsed the Vision Zero Initiative to eliminate traffic fatalities for pedestrians and bicyclists by the year 2024. The District Department of Transportation (DDOT) also has plans for additional bicycle facilities. This is a good start as today there are many more motorists who have begun to be considerate of bicyclists. The bicycle program in DDOT knows that creating safer streets is more than just painting lines on the road. But they are constrained by a small budget and traffic engineers traditionally trained to think mainly about cars. In the downtown area the DDOT Bicycle Program should do more to truly separate cars from bikes. I suggest that this should include more bicycle lanes separated from traffic by parked cars (with 3 feet for swinging doors) or other types of barriers. In my view based on 35 years of experience cycling on city streets, the downtown merge zones for cars crossing bike lanes to turn are confusing and sometimes dangerous. They also contribute to the feeling that cars are allowed to infiltrate bike lanes. Well marked green bike lanes continuing through intersections are a better option. I even would like to see Washington DC pilot some "projected intersections" with safety curbs and separate lanes for bicyclists and pedestrians. In designing a bicycle friendly city in Washington DC we are riding in the right direction, but there is a long way to go to reach our destination. 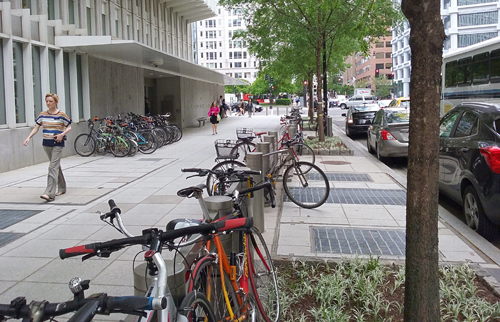 Note: Top image is by Doug Barnes in 2017 and it shows bikes parked at the World Bank close to the White House in Washington DC.